Here is a simple and easy plant-based Asian stir-fry recipe (using only 8 ingredients!) that everyone in your family will love. Pair this nourishing vegan, egg-free, dairy-free and nut-free dish with the grain of your choice, noodles or gluten-free alternative. Tofu and black beans are great protein sources which help make this dish tasty and nutrient-dense. This plant-based dish, in my opinion, tastes even better the next day and can also be eaten cold. If you like, make extra and freeze a portion in the freezer for another meal in the future! This Spiced Tofu Black Bean Medley dish uses a special type of marinated tofu product called Dried Spiced Bean Curd (also known as Five Spiced Dried Tofu). This product is typically found in the refrigerated sections of most Asian supermarkets. It usually comes in a packet of 2-4 square pieces, is brown in color on the outside and has a specific aromatic taste that goes great in stir-fries. But this product is also quite nutritious. Just one third of the package (or 100 grams) provides 8 grams of fiber, 13 grams of protein, 15% of Daily Value of Calcium and 20% Daily Value of iron! Here is an example of one of these marinated tofu product brands, but there are other ones out there. When buying a dried spiced bean curd product, check the ingredients and choose a product without any monosodium glutamate if possible. Also note that there are generally two types of spiced bean curd products – very thin and thicker sized bean curd squares, which affects the cooking time (see recipe for details). An easy, flavorful and nourishing protein-rich dish to be enjoyed with the rice, noodles or your favorite gluten-free alternative. Slice the dried spiced bean curd into thin strips. Heat up a tablespoon of sesame oil in a large skillet on low-medium heat. Once the oil is hot, add the sliced bean curd pieces. Cook for 5-7 minutes, stirring occasionally to prevent the bean curd pieces from sticking to the bottom of the pan and to spread the pieces out, until the bean curd pieces are browned. Turn down the heat setting if needed (if the bean curd pieces start to stick too much to the bottom of the pan). Note: if you use the thinner bean curd squares to cut into strips, you will only need to lightly pan-fry these for about 2-3 minutes in the sesame oil before removing them from the pan. Otherwise these bean curd strips will get tough and chewy. Meanwhile, slice the carrots and celery into thin strips (about 2 ½ inches in length) and mince the garlic. Remove the browned bean curd pieces from the pan to a small bowl. Set aside. Using the original skillet, heat one tablespoon of sesame oil in the pan. Once hot, add the garlic and sauté until golden, then add the carrot and celery strips, as well as the salt. Stir to coat the carrot and celery strips in the sesame oil. Let cook about 5 minutes or until the carrot and celery strips are cooked through. 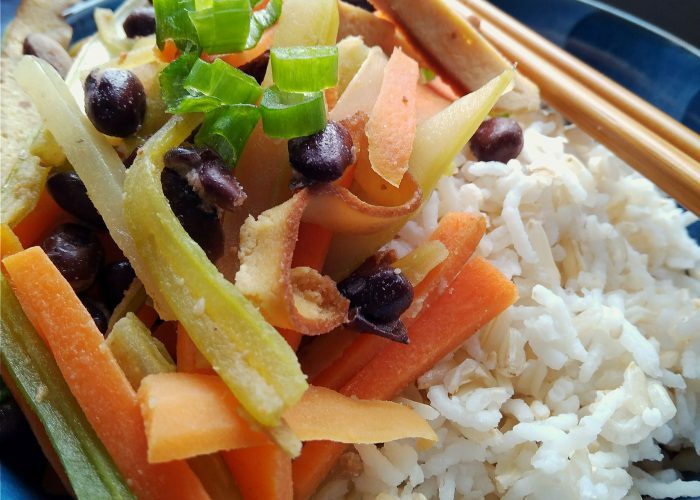 While the carrot and celery strips are cooking, marinate the cup of black beans with ½ tablespoon sesame oil and 1 teaspoon of soy sauce in a bowl. Stir together these ingredients and let the beans marinate for about 3-5 minutes. Add the browned bean curd pieces and the marinated black beans into the skillet. Stir-fry to mix together for 2-3 minutes (or until the black beans are heated through). Ready to serve and enjoy! wonderful healthy and delicious share love the black beans and tofu ! Thank you for your support Nisha and comment. I do appreciate it!! Wow ! Sounds like a simple yet super food !! Thank you for your words Megala, you are very kind!